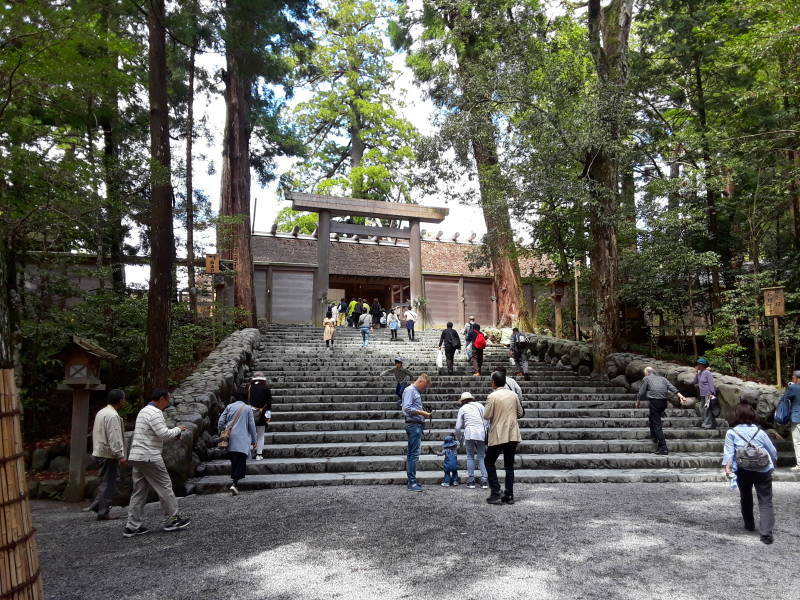 The Grand Shrine of Ise is the most holy and important shrine of Shintō. It actually consists of 125 shrines in two major complexes. 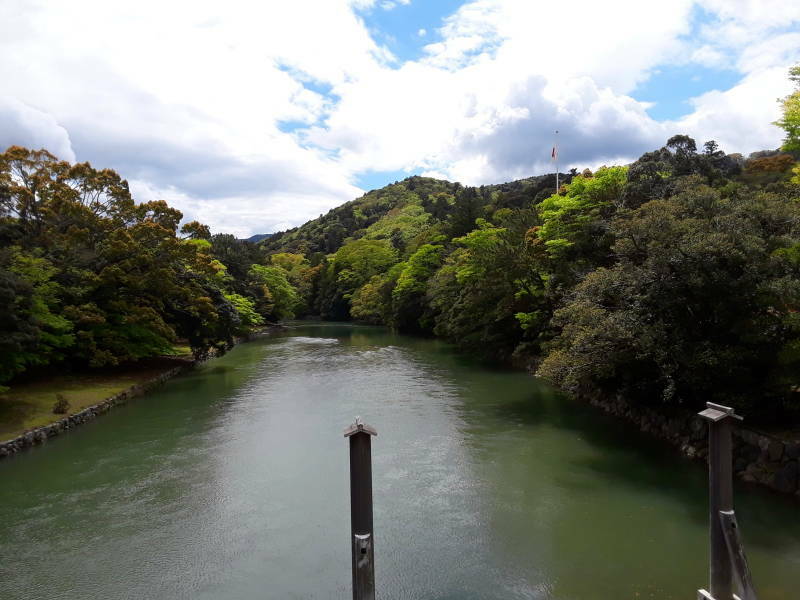 The Inner Shrine or Kaikū, officially known as Kōtai Jingū, is next to the town of Uji-tachi, at the base of the mountain south of central Ise. 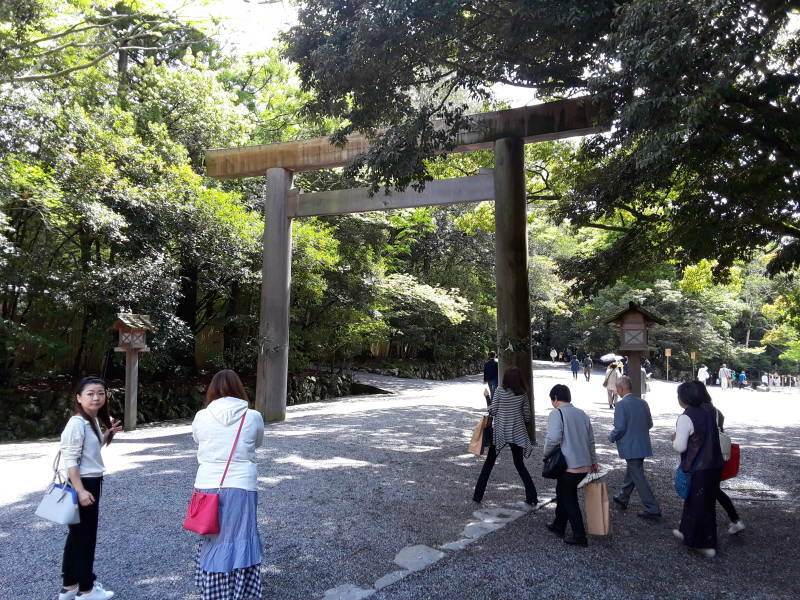 See the previous page on Gekū the Outer Shrine for background on the Shintō cosmology and the legends of the founding of the Grand Shrine. 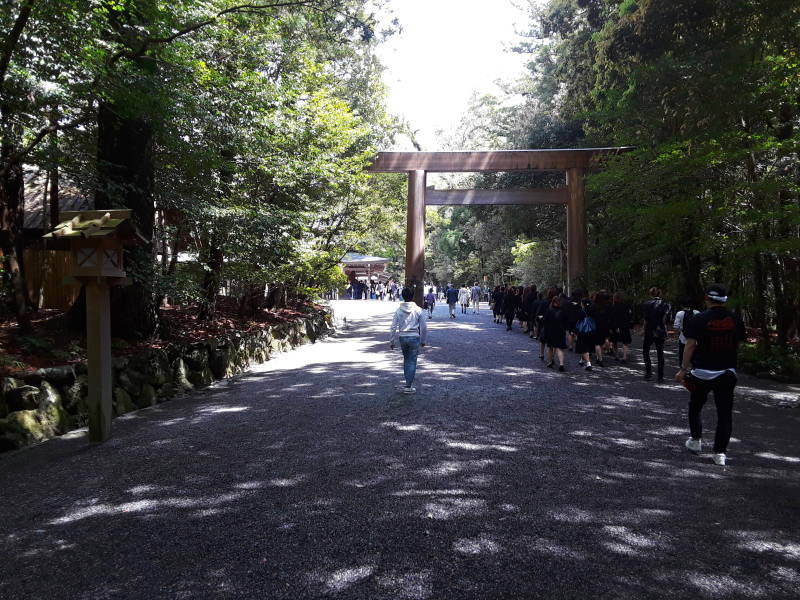 Also, see that page for how all of the shrines at Ise are completely reconstructed every 20 years, at a cost of half a billion Yen the last time. Frequent buses run between central Ise and the Inner Shrine. 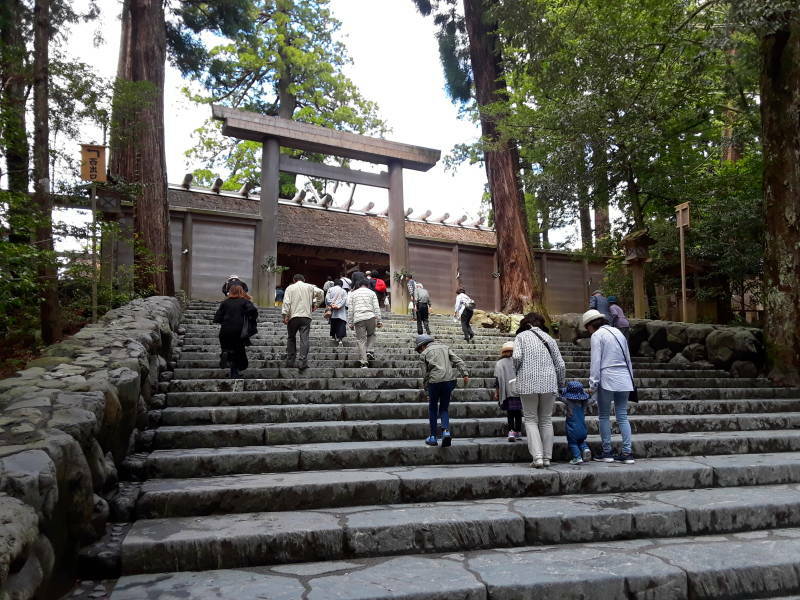 The main shrine here is believed to be inhabited by Amaterasu, the Sun Goddess. The role of chief priestess was originally held by female members of the Imperial House of Japan. During the years of Imperial Japan, starting when the Emperor retook power from the Tokugawa Shōgunate in 1868, the cult of the Emperor played up his divinity. The Emperor himself served as the chief priest at Ise during that period. What the Allies called "State Shintō" ended with Japan's defeat in World War II. Now a chief priest and most sacred princess are former members of the Imperial family or their descendant. An Emperor is simply known as "The Emperor" during his reign. He selects a name for his reign, and after his death he is known by that. Prince Hirohito became The Emperor in 1926, beginning the Shōwa period. Since his death in 1989, he has been known as Emperor Shōwa. Takatsukasa Kazuko became chief priest of Ise in 2007. He's the adoptive son of Takatsukasa Kazuko, the third daughter of Emperor Shōwa (formerly known as Hirohito). In 2017, Sayako Kuroda, the daughter of the reigning Emperor Akihito, became supreme priestess. 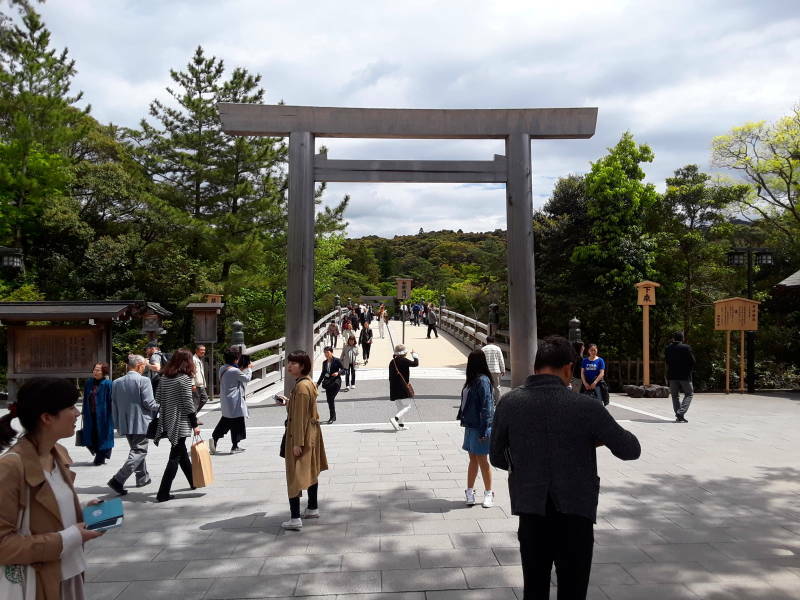 You pass through the first of many torii and cross the Uji Bridge. It's 100 meters long, built entirely without metal fasteners like the shrines. 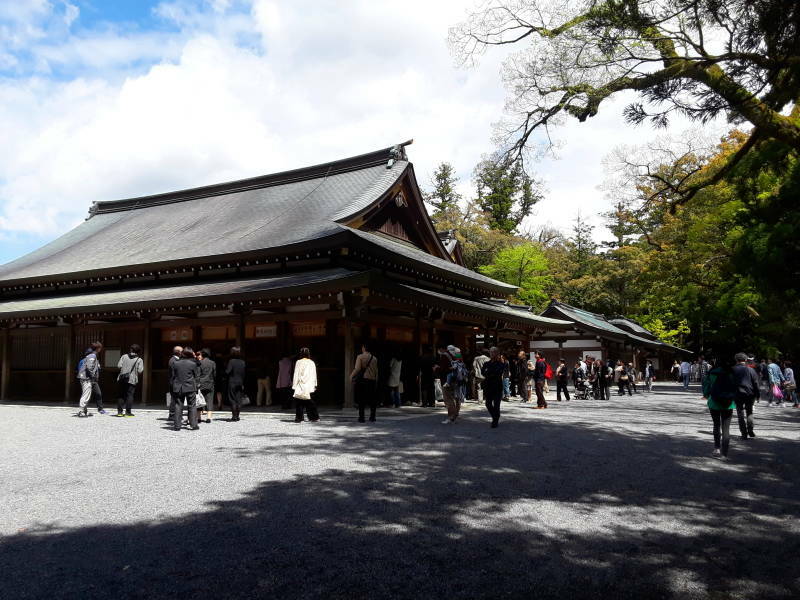 And like the shrine buildings, it is completely rebuilt every 20 years. The bridge crosses the Isuzu River. Its name means "Fifty Bells", going back to a legend about when the shrine was first set up to provide a home for the Sun Goddess Amaterasu. 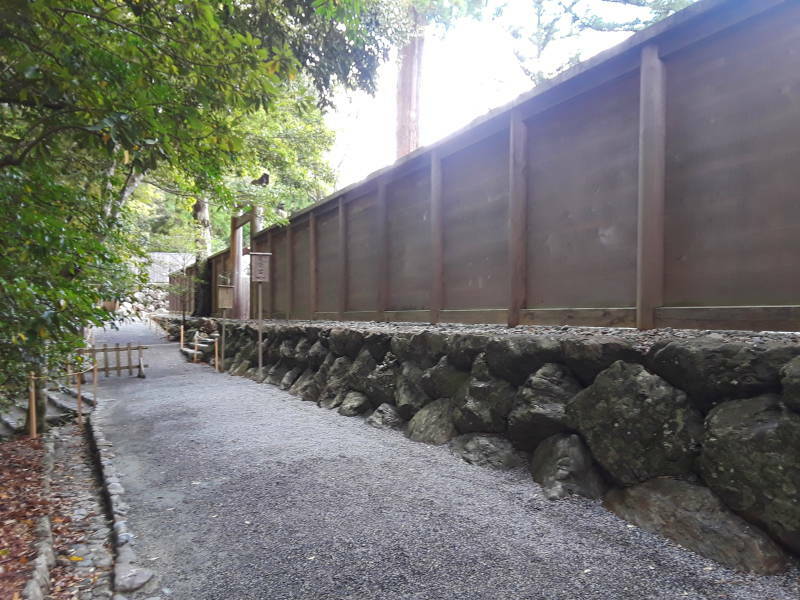 The smooth stones for the shrine building sites are collected from the river bed. Now the automotive company is named after the river. You soon come to the temizusha, the shelter over the fountain you use to wash your hands and rinse your mouth to clean impurities from your mind and body. Then it's on through more torii. Follow the crowds. There are halls for purification rituals, and for special prayers. We're very close to the main shrine. It's inside multiple layers of wooden walls. 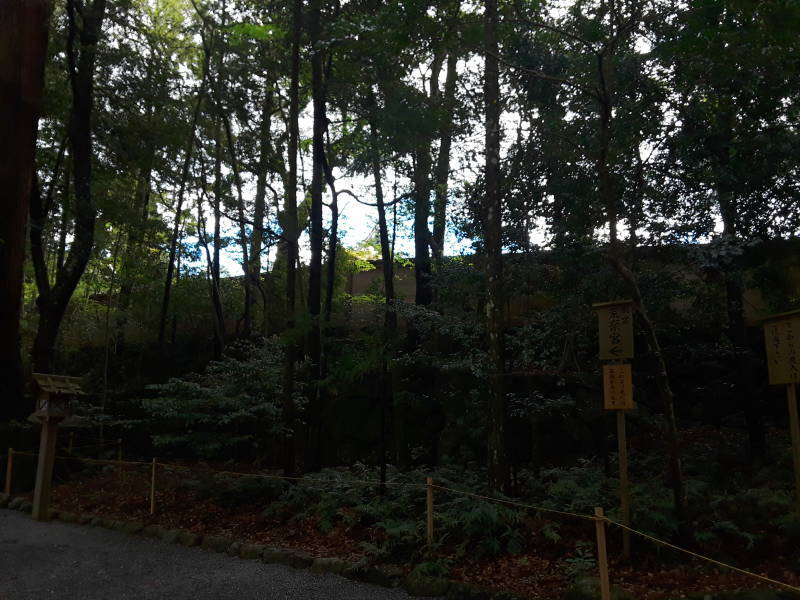 The outermost wall is visible through the trees in the last picture above. The idea is that you're supposed to go up and down the stairs along the sides, leaving the center free for Amaterasu to come and go. You can step through the first gateway through the outermost wall, but for most visitors that's it. You're kept within an area behind a wooden fence just inside the first gateway. The large group of women in somewhat formal dress were escorted by priests through a gate in that fence. They could approach the first auxiliary shrine within the outermost wall. A quick Bow, bow, clap-clap, bow and then right back out. From there you can see the next layer of solid wooden wall, and just the tips of the diagonal finials projecting above the ends of the roofs of the inner buildings. Again, just like other secretive sites like Groom Lake and Pine Gap and Raven Rock, Google can show us what it looks like from above. Or, at least what Google claims that it looks like. There isn't much you can see from the ground. Solid wooden walls, and glimpses of golden tips of roof parts. Things have been more liberal in the past. In the 1910s, the Imperial Government allowed the below photograph to be distributed. 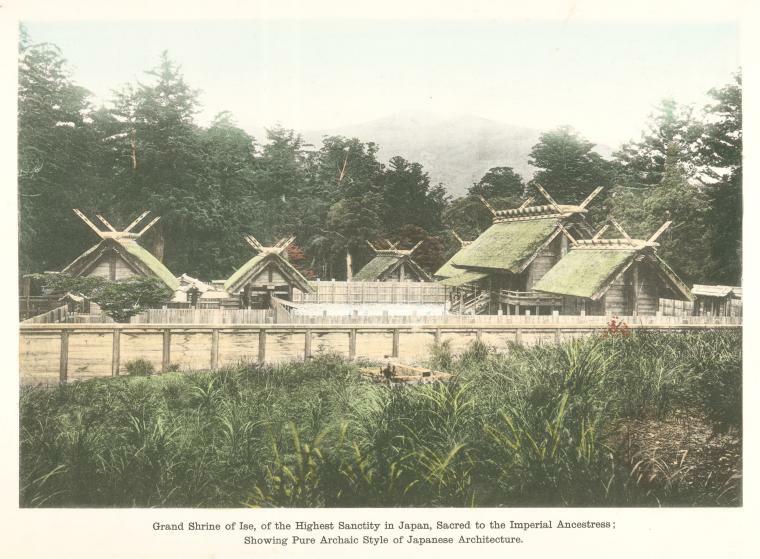 This picture is from the New York Public Library Digital Collection, where it's captioned "Grand Shrine of Ise, of the Highest Sanctity in Japan, Sacred to the Imperial Ancestress; Showing Pure Archaic Style of Japanese Architecture." The photo dates from 1910–1919, and it was published by the Imperial Government Railway. 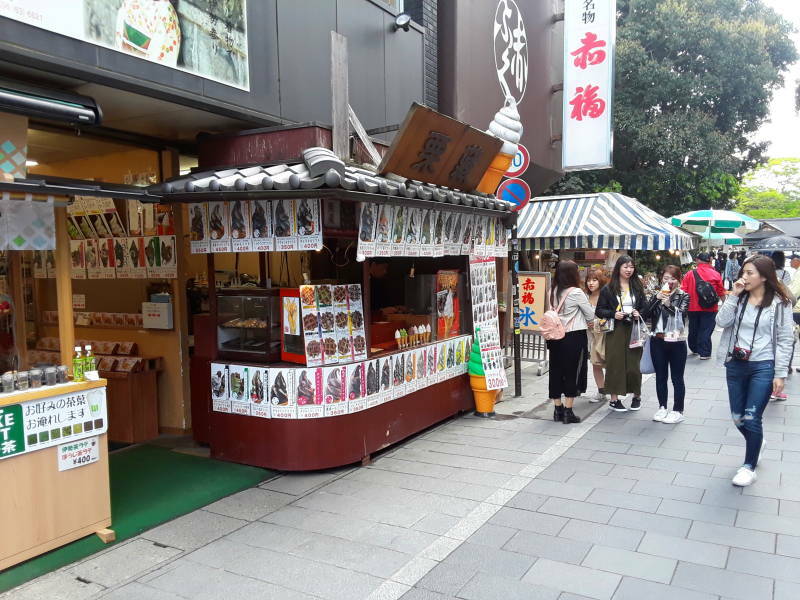 Meanwhile you can visit the 91 auxiliary shrines within the Inner Shrine complex. You can see this one's small oi-ya or hut hiding the shin-no-mihashira, the new Sacred Pole. The next iteration of this shrine will be built around that hut. Then the hut will be disassembled to expose the sacred pole within the shrine's innermost sanctuary. 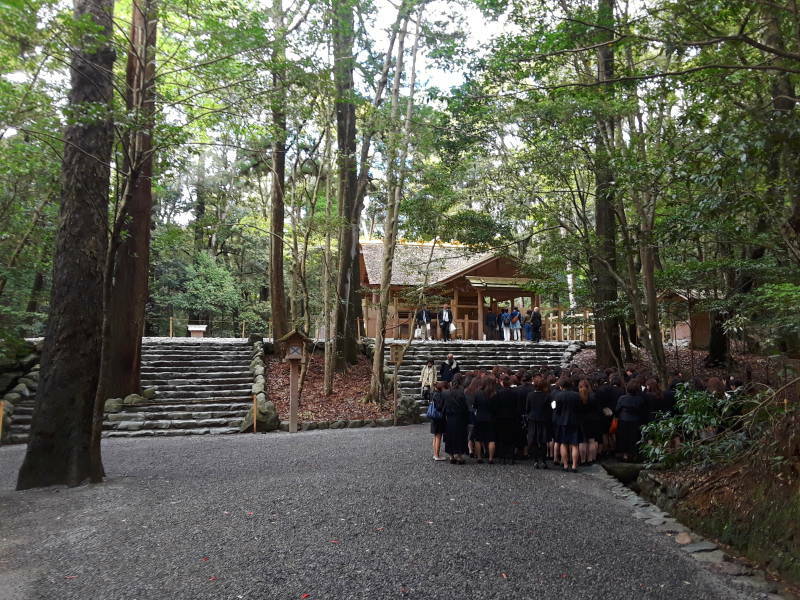 Meanwhile a new oi-ya will be built around the sacred pole inside the old shrine, so it can be disassembled. 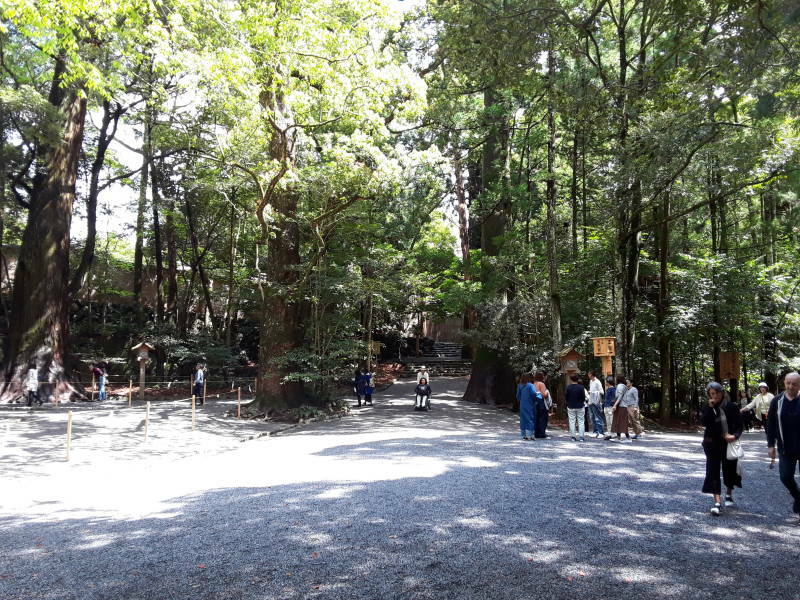 Kaikū, the primary shrine within the Inner Shrine Complex, is believed to house the Yata no Kagami, a mirror that is one of the Three Sacred Treasures of Japan. Those are the mirror, sword, and jewel forming the Imperial Regalia of Japan. 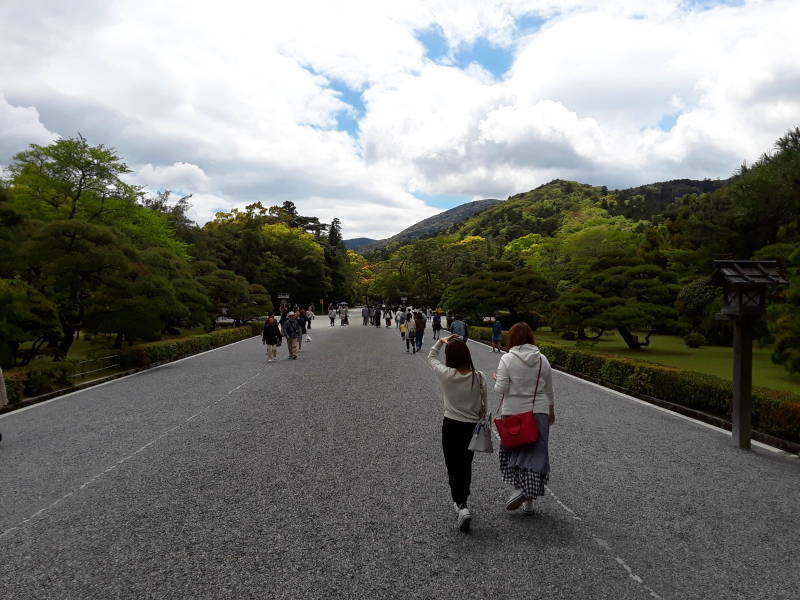 The official story is that the sword Kusanagi is in the Atsuta Shrine in Nagoya, the jewel Yasakani no Magatama (a comma-shaped large bead) is in the Imperial Palace in Tōkyō, and the mirror Yata no Kagami, is here. The legends say that Ninigi-no-Mikoto, grandson of the Sun Goddess Amaterasu and ancestor of the Emperors, brought them to Earth. He eventually gave them to his great-grandson, Jimmu, the first Emperor of Japan. They confirm the Emperor's status as a descendant of Amaterasu and his legitimacy as ultimate ruler of Japan. Elite priests present the three sacred objects to the new Emperor during the enthronement ceremony. 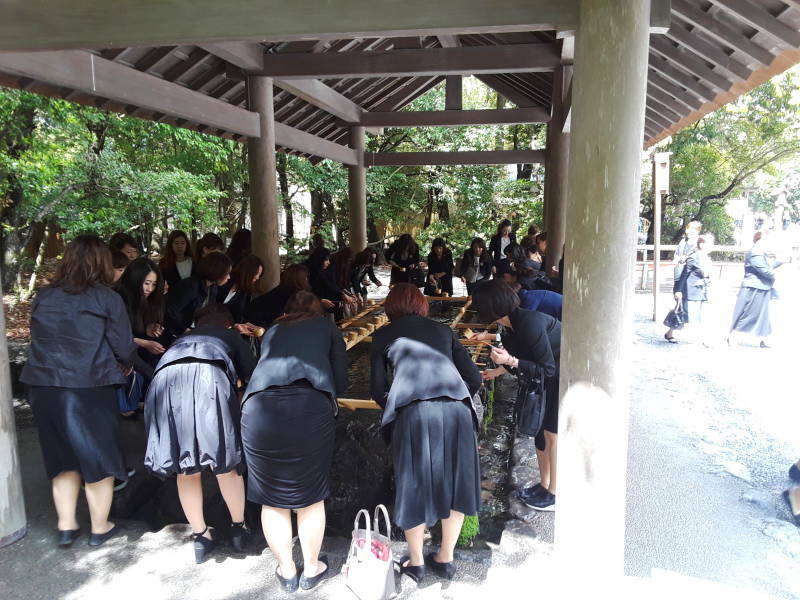 The ceremony takes place back within the innermost sanctuaries of shrines, so only the Emperor and a small number of elite priests see them. Or, see the packages in which they're kept. The legend says that the deity Ishikoridome forged the Sacred Mirror. 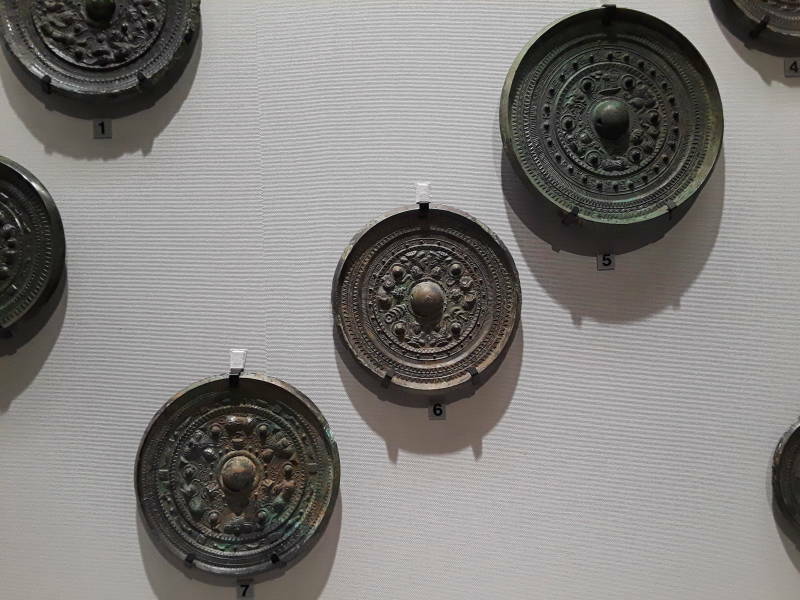 Artistic representations are based on bronze mirrors of the late prehistoric ages. 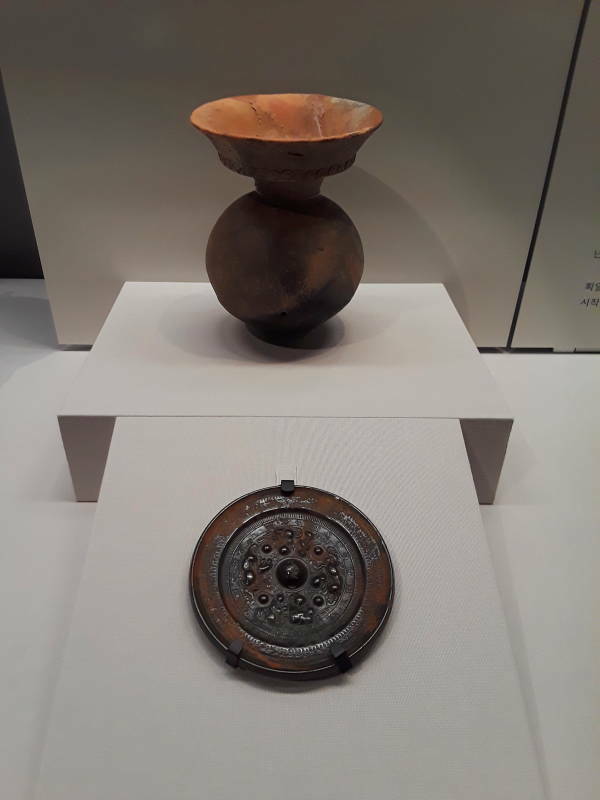 Here are some mirrors found in burial mounds near Nara and now in the National Museum in Tōkyō. 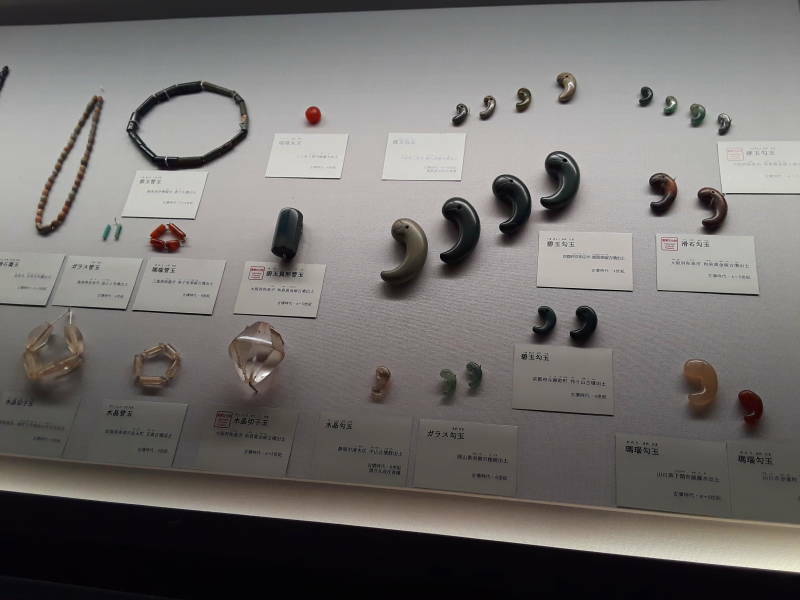 They date from the 4th to 5th century CE, during the Kofun Period. We're looking at their decorated back sides. The polished reflective surfaces are the opposite sides. These beads are from the same period and area. The Sacred Jewel is thought to be like one of the larger comma-shaped ones in the right half of the picture. 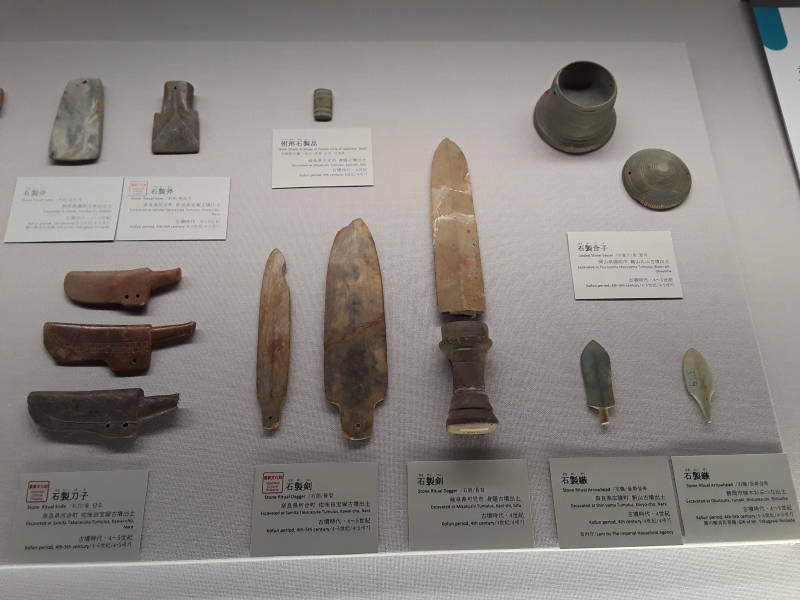 Finally, some stone ritual daggers from near Nara in the Kofun Period. So, if the Sacred Regalia survive, they probably resemble the above. The Sacred Jewel has a pretty good chance of existing. The Sacred Mirror, however, has a sketchy history. Consider what it went through when Emperor En'yū was on the throne. En'yū was the 64th Emperor according to the traditional listing. He lived from 959 to 991, his reign included the years 969 through 984. En'yū became Emperor when he was just 10 years old, in 969. On June 8, 976, the Imperial Palace in Kyōto burned down. The Sacred Mirror was blackened to the point that it reflected no light. That was just the start of its problems. The replacement Imperial Palace burned down on December 31, 980. The Sacred Mirror was "half destroyed". Then, on December 5, 982, the replacement for the replacement Imperial Palace burned down, and the Sacred Mirror was "reduced to a lump of melted metal". The priests found the lump and brought it to En'yū. On top of the repeated fires and mirror destructions, there was an ongoing violent struggle over who would become the regent and rule on behalf of En'yū. On September 24, 984, En'yū had had enough. He abdicated at the age of 26. He became a Buddhist priest and took the name Kongō Hō. He died in 991 at the age of 32. All that is described in Gukanshō: The Future and the Past. Then, in 1040, the cabinet containing the Sacred Mirror (or Melted Lump of Metal) burned in a fire. So, almost no one knows what is stored here at Ise, wrapped in layers of packaging. Of the very few who do know, no one is talking. Going back to the bus stop to return to Ise, you pass through Oharai Machi. 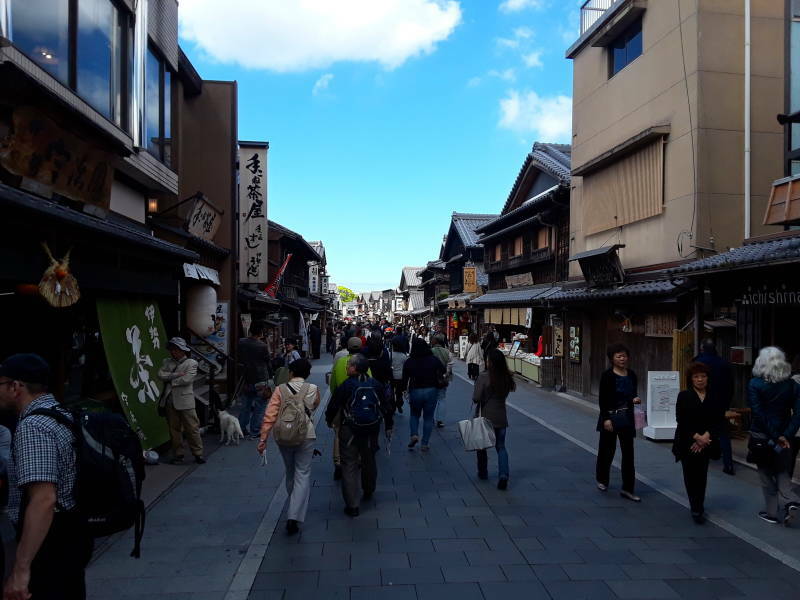 This side street is filled with shops selling souvenirs and food. 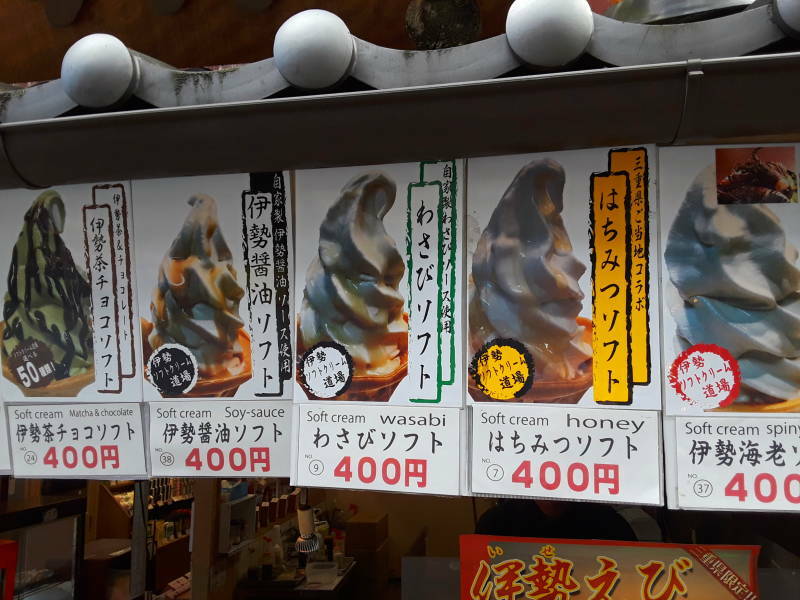 This ice cream vendor offers a wide range of flavors. Matcha (green tea), soy sauce, wasabi (horseradish), spiny lobster, crab, roasted sesame seed, and many more unexpected flavors! I had the wasabi.